Kris Kristofferson has had a roller-coaster career, from military service and an Oxford scholarship to cleaning floors in a Nashville recording studio and making it big as a country singer and movie actor. At 74, his beard now totally white, he stands centre-stage, guitar in hand and harmonica at his lips. You can still see the Hollywood-grade cheekbones that earned him legions of female admirers. What a privilege it was to be in the front row at Cadogan Hall, and for two nights running be able to witness the creativity, simplicity and sheer humanity of this multi talented, yet humble man… Kris is definitely one of our top heroes! 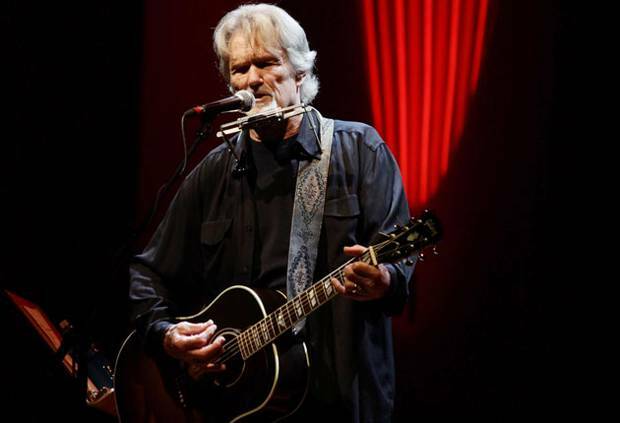 Kristofferson’s fame owes much to the songs he has written for other singers – here, “Me and Bobby McGee” is received with wild applause. The song, written for Roger Miller and a posthumous hit for an ex-girlfriend, Janis Joplin, remarks: “Freedom’s just another word for nothing left to lose.” Kristofferson’s rendition is soft, smoothing the tune’s husky edges but preserving its resonance. He sings about alcoholism, dope, the devil, prison and his family. You can see why he and Johnny Cash got along. The septuagenarian smiles politely down at the audience but his lyrics are dark as night. His version of “Sunday Mornin’ Coming Down”, a song made famous by Cash, rings true despite Kristofferson having kicked the booze in 1976. Having galloped joyfully through 28 songs, a slightly overwhelmed Kristofferson retires to a standing ovation. Female fans scream for more. Returning for three encores, he finishes by shouting the last line of “Please Don’t Tell Me How the Story Ends”. Thanks for this Beryl & Gurus, reminds me so much of his Berlin gig last year, will never forget his touching performance.